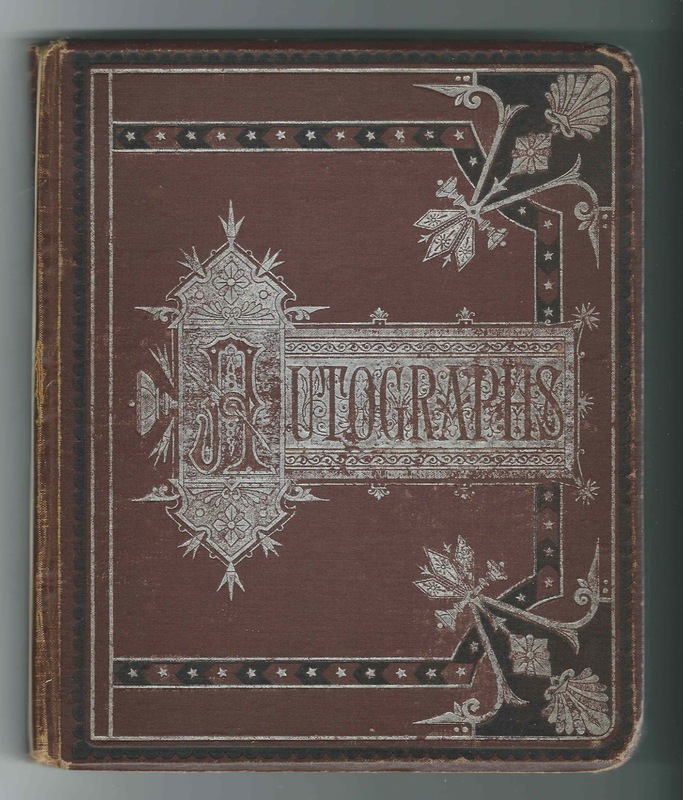 1877-1880s autograph album that belonged to one of the Richardson brothers of Hartland, Vermont. Because all of the brothers that I found, except one, inscribed pages in the album, it apparently belonged to Edward C. Richardson. Another post features the 1863-1875 autograph album of Edward's oldest brother, Leonard H. Richardson. That album contains pages inscribed by two of their sisters, Martha Ellen (Richardson) Woodward, "Nell", and Marion H. (Richardson) Metz Headle, both of whom inscribed pages in Edward's album as well. The album, a large one, measures approximately 8-1/2" x 7" and contains the sentiments of 112 of Edward's relatives and friends, including those met on trips out west to the Midwest, Dakota Territory and Oregon. An alphabetical surname list and an alphabetical list of the signers, together with any personal information they offered, appear at the end of this post. Edward C. Richardson was born January 21, 1855 at Hartland, Vermont, the son of Paul Demedes Richardson and Nancy Taylor (Hamilton) Richardson. I found Paul's middle name was on his granddaughter's application to the California State Society of the Colonial Dukes of the 17th Century. Edward's mother, Nancy Taylor (Hamilton) Richardson, inscribed the first page in his album on April 12, 1883, though she was not the first to inscribe a page. Edward's oldest brother, Leonard H. Richardson, who died in 1882, inscribed a page at Boston, Massachusetts, on March 21, 1880. Sister Marion H. (Richardson) Metz, who inscribed her page at Hartland, Vermont, on January 7, 1879. Marion's first husband, Emanual Metz had died in 1877. She would marry Reuben W. Headle in 1887. Sister Martha Ellen (Richardson) Woodward, "Nell", wife of George W. Woodward, inscribed a page at Portland, Oregon, on March 2, 1885. Sister Sarah M. (Richardson) Clark, wife of Daniel Campbell Clark, who shared the page with her, inscribed a page on November 18, 1879. Mr. and Mrs. A. B. Connor, who inscribed a page at Manchester, Vermont, on August 26, 1879. Mrs. Connor was Harriet (Richardson) Connor, Edward's sister. Brother John P. Richardson of Clarence Centre, New York, inscribed a page on January 29, 1883. 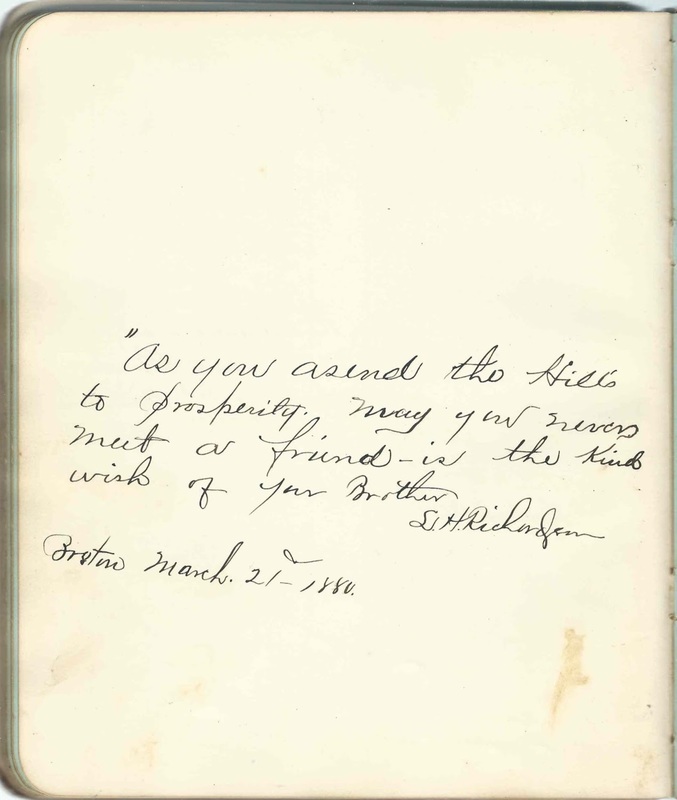 Brother William T. Richardson inscribed a page at Cambridge, Massachusetts, on August 12, 1879. William's daughter Nancy H. Richardson signed the only 1900s autograph in the album beyond the 1880s, in 1911. Edward was living with William and his family at the time of the 1910 Census of Hartland, Vermont, so it would have been plausible for Nancy to inscribe a page in the album, if it had suddenly come to light. Many more relatives and in-laws inscribed pages in the album. I tried to describe family connections as best I could in the list of signers, but I undoubtedly missed a few. I don't believe that Edward ever married. He died in Putney, Vermont in 1939. 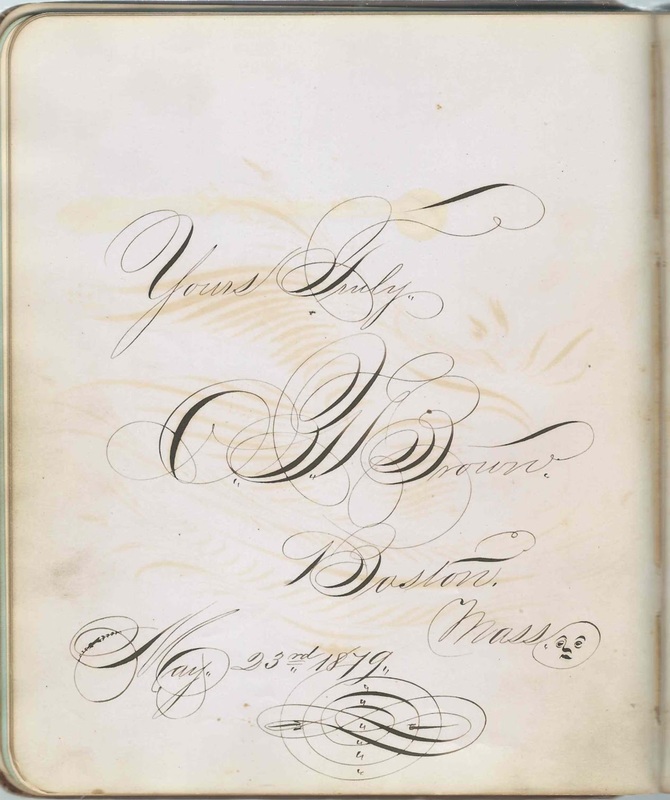 Even though probably not a relative, the two page sentiment left by someone in Boston named Brown, with ornate initials, just begged to be included here. The design is one of the most intricate and beautiful that I've encountered. Ainsworth  Eastman M ? S ? Marion M. Allen of Hartland, Vermont, signed on November 3, 1881. Shared the page with Minnie W. Alexander. William Alton, Jr. of Chicago, Illinois, signed "At sea"
Georgina Brebonius; shared the page with W. J. M.
Very ornate initials: ? 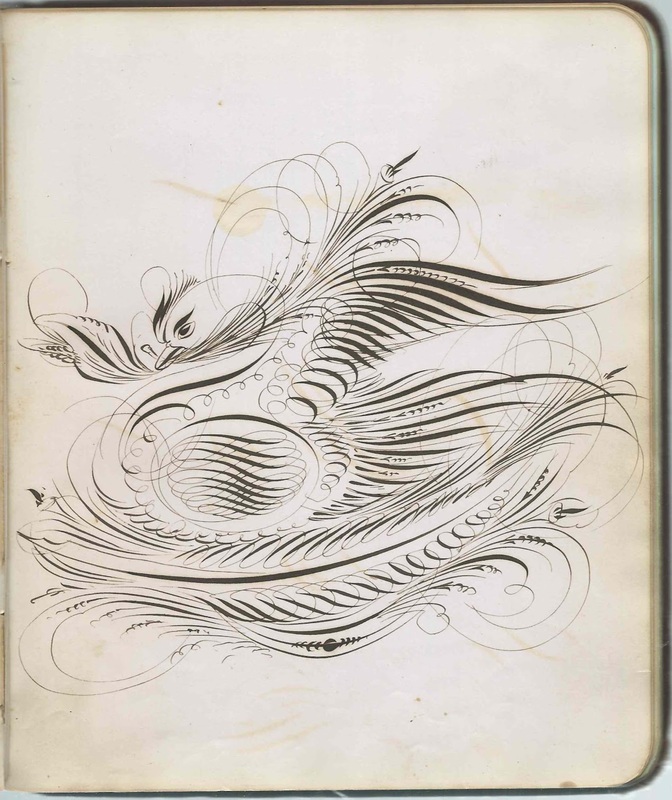 Brown of Boston, Massachusetts, signed on May 23, 1879; beautifully intricate bird design on the facing page. Sarah M. Clark of Orford, New Hampshire, signed on November 18, 1879. The album owner's sister, Sarah M. (Richardson) Clark, wife of Daniel Campbell Clark, who shared the page. D. C. Clark. Daniel Campbell Clark, husband of the album owner's sister Sarah M. (Richardson) Clark, who shared the page with him. Effie L. Clay of Gaysville, Vermont, signed at Hartland, Vermont, on November 30. 1879. Future wife of album owner's brother William Thomas Richardson. Mr. and Mrs. A. B. Connor, signed at Manchester, Vermont, on August 26, 1879; presumably Mr. and Mrs. Alvin B. Connor. Mrs. Connor was Harriet (Richardson) Connor, Edward's sister. Mrs. Creighton of Spiritwood, Dakota Territory on October 28, 1883. She also mentioned Wallace, Nova Scotia, which may have been her native home. Stanley Gill of Hartland, Vermont, signed on September 5, 1922. Mrs. Emma Handley, signed at Spiritwood, Dakota Territory on May 22, 1883. Shared the page with Mrs. Elva S? Nettie B. Harding of Hartland, Vermont, signed on November 14, 1881. Shared the page with Florence S. Hemenway. Emma C. Headle of Hartland, Vermont, signed on December 15, 1879. She was Emma A. (Clay) Headle, first wife of Reuben W. Headle. After Emma's death, Reuben married the album owner's sister Marion H. (Richardson) Metz, widow of Emanual Metz. Florence S. Hemenway of Hartland, Vermont, signed on November 14, 1881. Shared the page with Nettie B. Harding. Laura Metz of Clarence Centre, New York, signed on January 29, 1883. Presumably the sister of Mary Metz, who would marry the album owner's brother John P. Richardson. Frank Metz of Clarence Centre, New York, signed on January 29, 1883. Emanuel Metz, first husband of the album owner's sister, Marion H. (Richardson) Metz Headle, had a brother Benjamin Franklin Metz and at least one nephew with the same name. The handwriting seems to me to be more of the nephew's generation. Mary A. Metz of Clarence Centre, New York, signed on January 12, 1883. Presumably the Mary A. Metz who married the album owner's brother John P. Richardson. She was the niece of Emanuel Metz, first husband of the album owner's sister Marion H. (Richardson) Metz Headle. William Parker of Galesburg, Illinois, signed at Hartland, Vermont, on July 31, 1879. Shared the page with Hattie C. Labaree. Edward C. Richardson of Hartland, Vermont, presumably the album owner, by process of elimination. 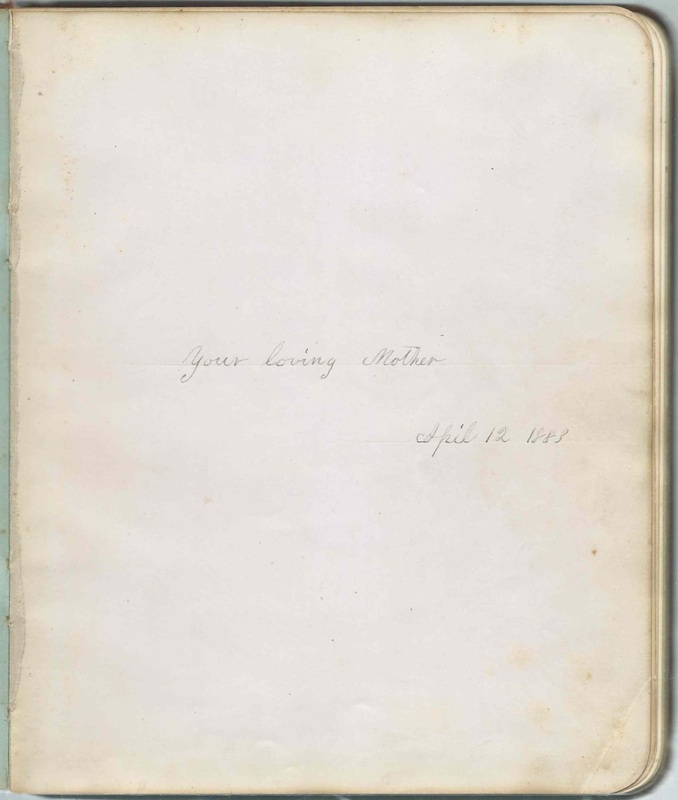 "Your loving Mother", inscribed on April 12, 1883. Nancy Taylor (Hamilton) Richardson, wife of Paul Demedes Richardson. Miss Nancy H. Richardson, 1903-1911. Daughter of signer William Thomas Richardson. Nancy was born in 1903, and apparently wrote the sentiment in 1911. Her father's unmarried brother, Edward C. Richardson, who I believe was the album owner, was living with the family at the time of the 1910 Census. J. P. Richardson of Clarence Centre, New York, signed on January 29, 1883. Album owner's brother John P. Richardson. William T. Richardson, signed at Cambridge, Massachusetts, on August 12, 1879; album owner's brother. Sidney Richardson, signed at ?, possibly North or South, Columbia, California, on January 16, 1887. Cousin of the album owner. Sidney Ward Richardson, son of Ward C. Richardson and Sarah Lavina (Hoisington) Richardson. Ward was the brother of the album owner's father Paul Demedes Richardson. Minnie M. Scott of Hartland, Vermont, signed on November 17, 1882. Shared the page with Emma E. Scott. Emma E. Scott of Hartland, Vermont. Shared the page with Minnie M. Scott. Maud L. Slayton of Hartland, Vermont, signed on November 3, 1881. Shared the page with May L. Slayton. Mrs. M. S. Steele of Hartland, Vermont, signed on September 25, 1879; middle initial could be L.
Benjamin F. Wallis of Fitchburg, Massachusetts, signed at Saratoga, New York, on "8/9/79"
W. H. Weston of Jamestown, Dakota, signed in May 1883. Also mentions Danvers, Massachusetts; not sure if Danvers was the signer's place of birth or if the page was inscribed there, but I believe the former. Emma Winch of Hartland, Vermont, signed on February 3, 1881; presumably Emma Dearborn (Heath) Winch, whose husband Frank signed the left facing page. M. Ellen Woodward of Portland, Oregon, signed on March 2, 1885. The album owner's sister Martha Ellen (Richardson) Woodward, wife of George Woodward. In the companion autograph album that belonged to brother Leonard H. Richardson, she signed as "Nell".